Presented by Illinois Wesleyan University’s School of Theatre Arts, February 21-26, 2017. The production was directed by Professor Thomas Quinn, and featured scenic designs by Professor Curtis Trout, lighting designs by Sunniva Holmlund ’17, sound designs by Dani Von Helms ’17, and costume designs by Connor Speck ’17. 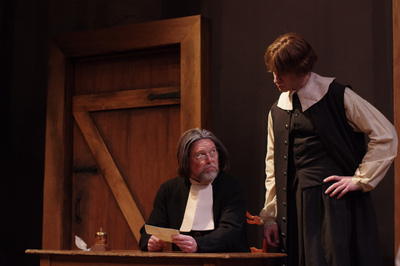 Set in a small Massachusetts town in 1692, Arthur Miller’s classic drama is a partially fictionalized account of the Salem witch trials that occurred during that period. Winning the Tony Award for Best Play in 1953, the piece is regarded as a central work in the canon of American drama. The images in this collection are the property of Pete Guither, and presented here with permission. For more information or to contact please see Pete Guither Photography.